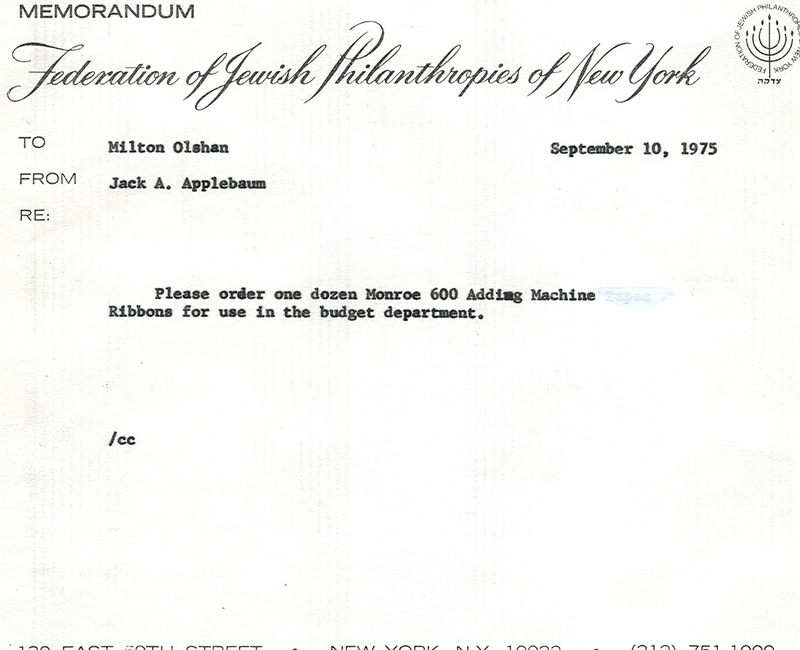 On Tuesday, we spoke with Dr. Morton Teicher, via phone, about his recollections of working with the Federation of Jewish Philanthropies of New York. Dr. Teicher was the Dean of the Wurzweiler School of Social Work at Yeshiva University from 1957-1972. 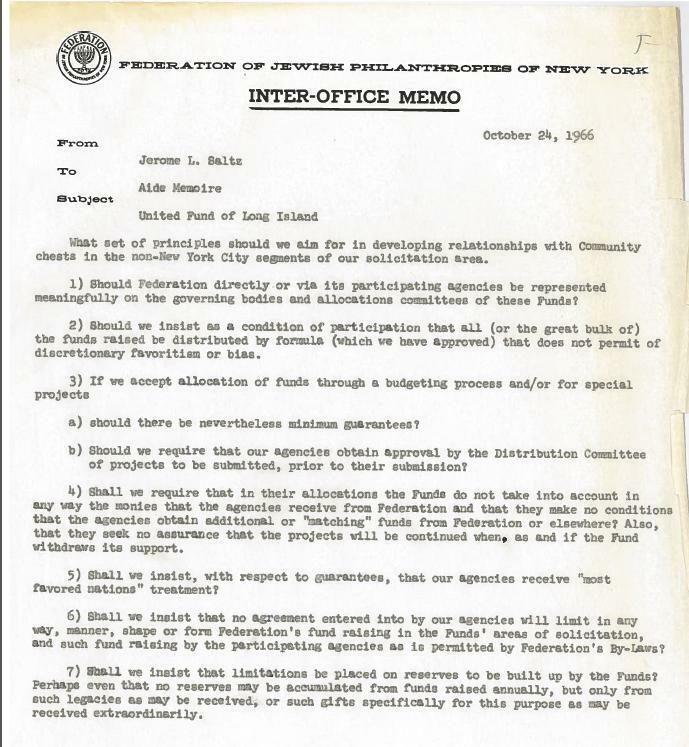 From his home office, he discussed the founding of the school at Yeshiva University, the history of Jewish-oriented social work and services education in New York City, and his cooperative and supportive relationship with the Federation, including receiving advice from Federation executives and assistance in finding field placements for his students at Federation agencies. Also, Dr. Teicher shared his understanding of the Federation’s structure and agencies, during his tenure as Dean, and how he became acquainted (and later friends) with prominent Federation executive staff members Maurice Hexter, Joseph Willen, Martha Selig, and Graenum Berger. Dr. Morton Teicher at University of North Carolina, Chapel Hill. 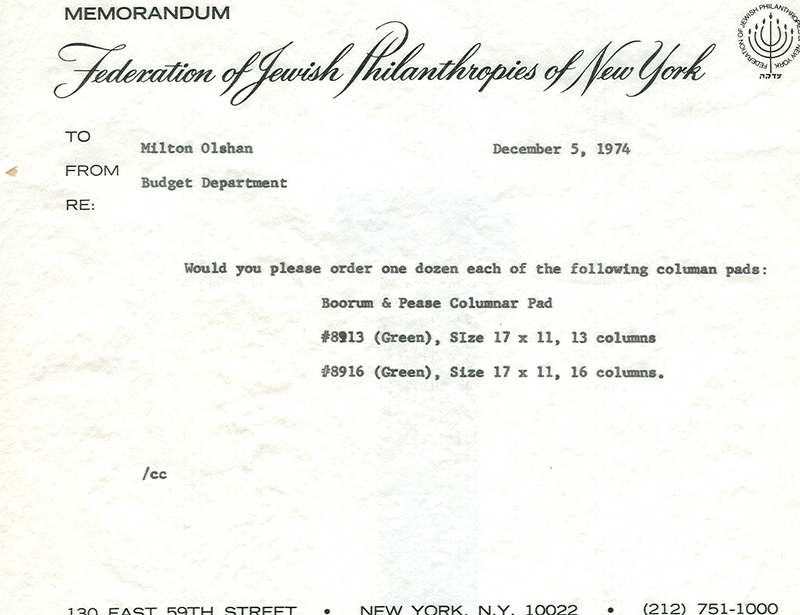 The archivists working on the UJA-Federation processing project would like to thank Dr. Morton Teicher for taking the time to speak with us. It was interesting and informative to learn about the cooperative spirit between the Wurzweiler School and the Federation during the 1960s and early 1970s. 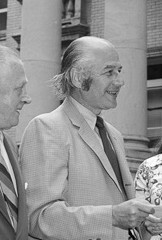 Federation’s Budget Director approved all but the most basic orders of office supplies in the 1970s, judging by a brief collection of memos to the Order Department at Federation from the Budget Department. 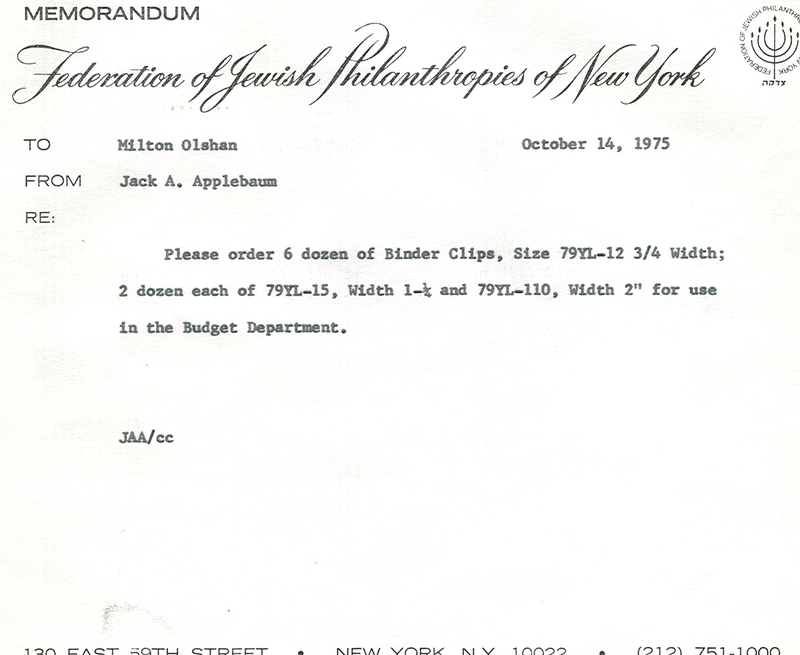 During Jack Applebaum’s tenure as Budget Director, his name appears on half of the 12 memos in his file for the fiscal year 1974-1975. Endless numbers of the spreadsheets ordered via the memo above survive in the budget files, so many that they are one of the few items we do not unfold and rehouse in oversized boxes. We find most of the spreadsheets folded in legal size folders and we leave them there, as they are stable and more useful when not removed from the other, 8 1/2 x 11″ documents in the folder. Some spreadsheets are final, typewritten documents that appear to have been distributed with various reports (apparently typed on wide-carriage typewriters to accommodate 17″ paper) and some are drafts in pencil. Some have columns inserted or added on top with corrections, held in place with scotch tape or rubber cement (see memo below). Neither tape nor rubber cement is archival in nature and many of the insertions have loosened; to unfold one of these spreadsheets is to risk losing track of which piece goes with which sheet. Because we are minimally processing the Federation files, we cannot take the time to rehouse, photocopy or scan each of these sheets. We attempt to clip pieces together which does no further damage to the spreadsheets. If these budget files generate research interest, which they should because of the enormous amount of data contained within them, we will return to them at a later date and stabilize and/or rehouse them to a greater degree. The rubber cement referred to above. Google images has many familiar looking images of rubber cement cans. 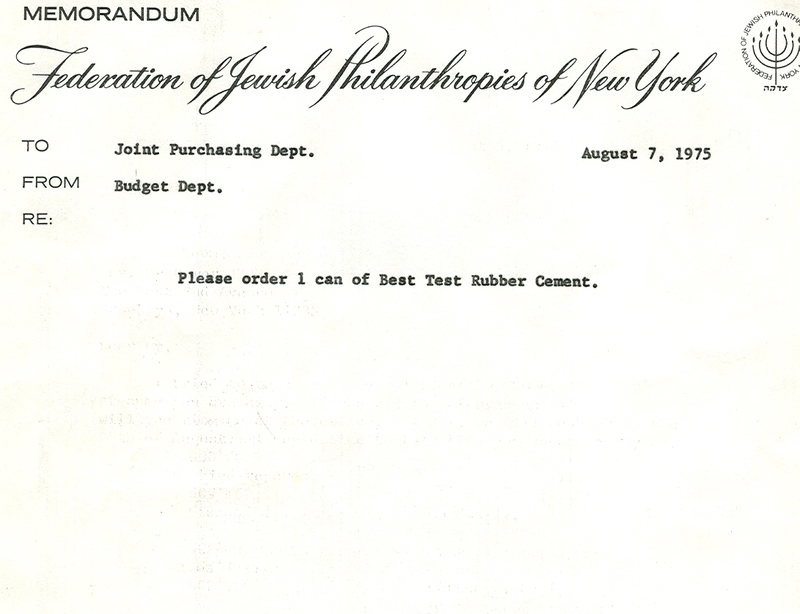 Judging by the amount of pasting that was going on in the Budget Department, the can the department ordered on August 7, 1975 was probably at least the gallon size. Binder Clips still remain in some of the files. We remove them as they take up a lot of space, may rust, and can damage the paper. Adding machines were in use in the 1970s of course, and adding machines needed typewriter ribbons and narrow strips of paper. Many of the calculations run through an adding machine are clipped to the spreadsheets, further documenting the analysis and calculation that went into the pulling together of huge amounts of data into a reliable and informative spreadsheet. The Budget Department’s spreadsheets, of course, made it possible to present concise figures in the many consolidated budget reports presented by the Budget Department to Federation’s Distribution Committee. It was this Committee that made final budgetary recommendations every year to the Board of Trustees, for each of the more than 100 agencies funded by Federation. The grownup version of the “Duck and Cover” technique schoolchildren rehearsed regularly in the 1960s is laid out in the following chart. It was the procedure Federation employees rehearsed in their mid-town New York offices so they would be prepared in case of an air raid. 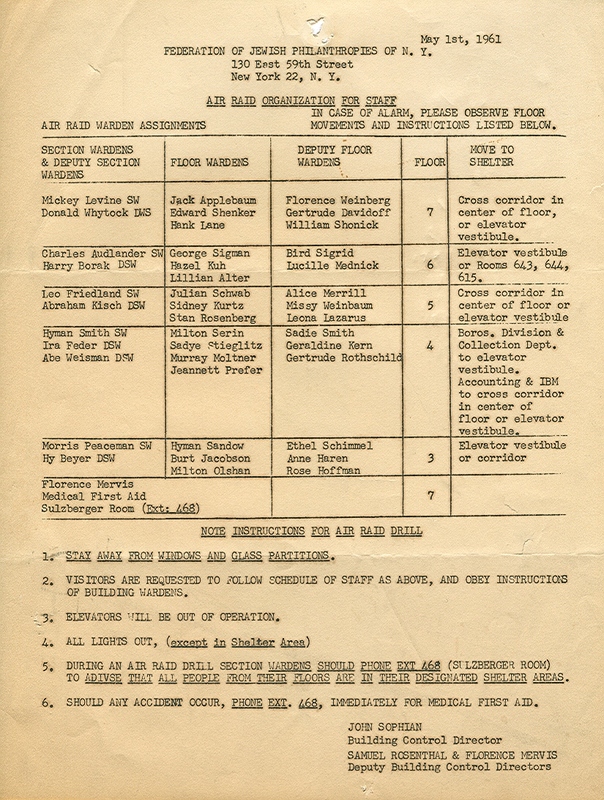 Below is Federation’s list of wardens and instructions on where to go, from May 1, 1961. 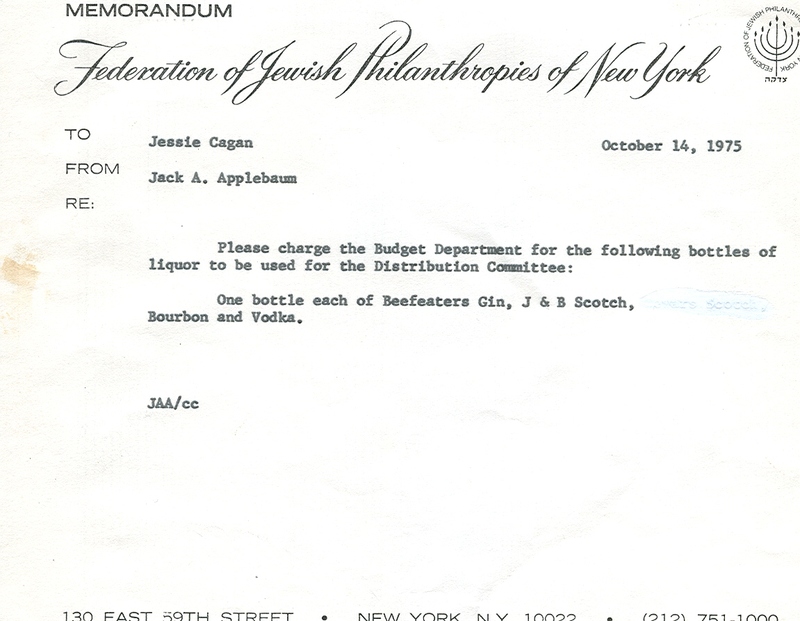 No doubt this directive was retained permanently among other Budget Department papers because Jack Applebaum, Assistant Budget Director at Federation throughout the 1960s, was the floor warden for the 7th floor, and because it appears from his endless files that Jack never threw anything out. Ever. This document turns out to be a good source of who worked in which department in 1961, and we will retain it in the files permanently. What’s a good way to keep track of facts and details at work, when it is no longer possible to slip a written reminder into a paper folder? Key in a reminder to an iPhone? Scribble something on a sticky note and stick it to a computer screen? Send an e-mail to oneself? Or, more formally, write a memo in WORD and file it in an electronic file? I’ve seen notes in paper folders in the past that called themselves “note to file”, but I’ve recently come across two documents addressed to “Aide Memoire”, really to the writer’s memory. Clearly, he was thinking through a problem, perhaps in preparation for a meeting or for a report to a committee or agency executive. 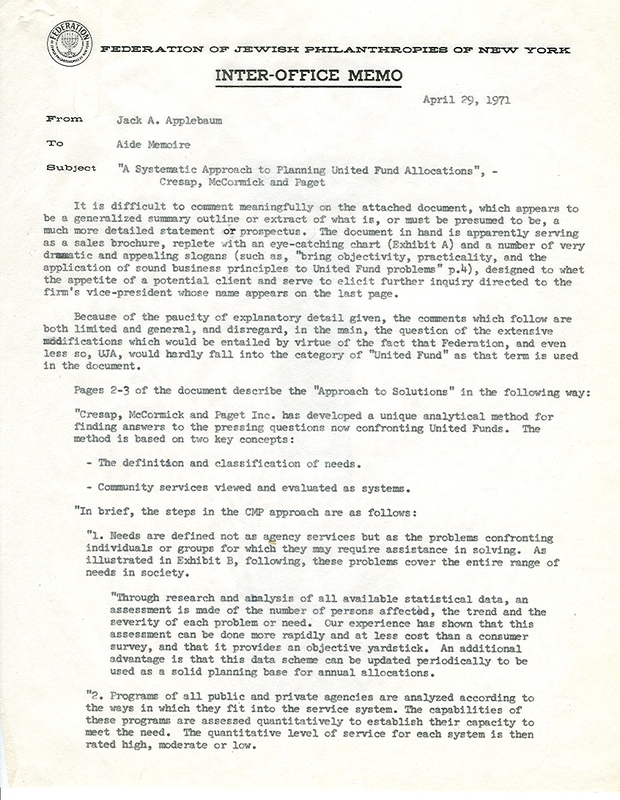 Nothing was decided in this memo, but he could return to it whenever necessary to refresh his memory as to what he had already thought through in solving this particular problem. 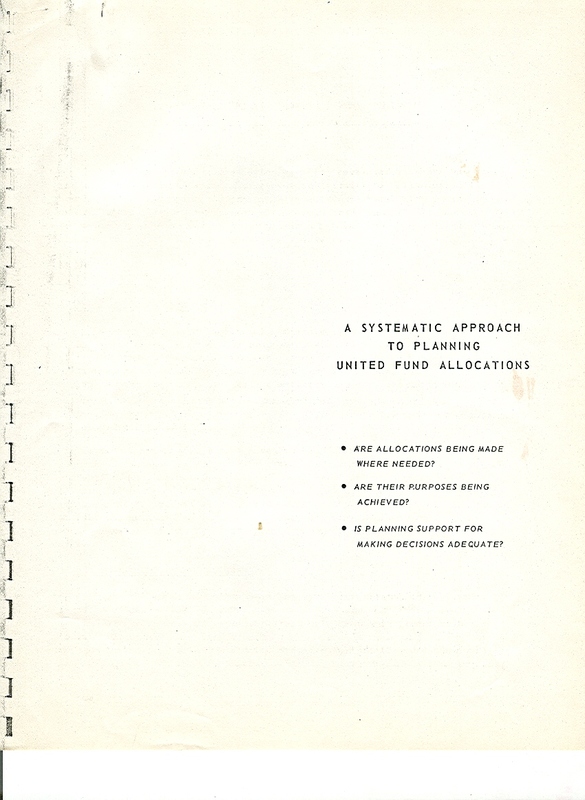 It may be that only leadership in the Budget Department wrote such memos to place in their own files, or it may have been the Federation style in the 1960s and 1970s. We’ll continue to look for more of these documents, which are simple windows into a different way of working, and of keeping our thoughts in order and in the right place while those thoughts are still incomplete.